Pelican L08- Relax and Getaway by booking this piece of paradise today! Pelican L04 is a Lanai unit that has just been completely remodeled and updated. It has convenient access to amenities, such as the Lazy River, through your own private gate. 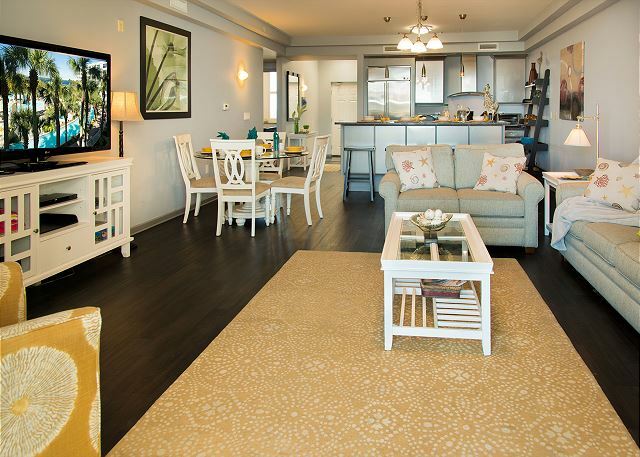 Book today and be the first to enjoy this amazing condo at Destin West! Pelican PH 06 - You will feel on top of the world when staying in this luxurious condo. With roof access and beautiful views of the ocean and the bay, you cannot beat this unit. Book with us today! Sandpiper L05 is a 1 bedroom plus bunkroom lanai level condo in the Sandpiper Building at DestinWest Beach and Bay Resort. Book now for 2019! 1 Bedroom condo plus bunk room that sleeps 6 with a view from the rooftop deck where you can get lost in a sunset each night..
Beautiful 3 bedroom (2 bedroom plus bunk room) penthouse condo at Destin West Bayside!! Must See Views!! Pelican 303- is the perfect two bedroom with bunk. It is furnished with simple but cozy Amish furniture. 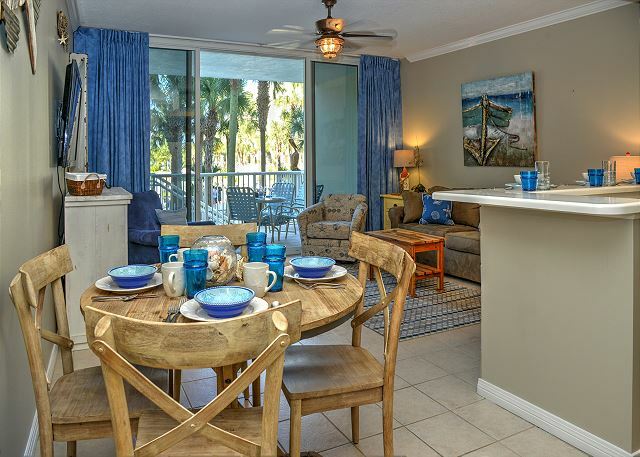 The kitchen is well stocked and the condo is conveniently located near all of the amenities Destin West has to offer! Sandpiper 602- Enjoy this beautiful condo, and all of our amenities including the 700ft Lazy river. 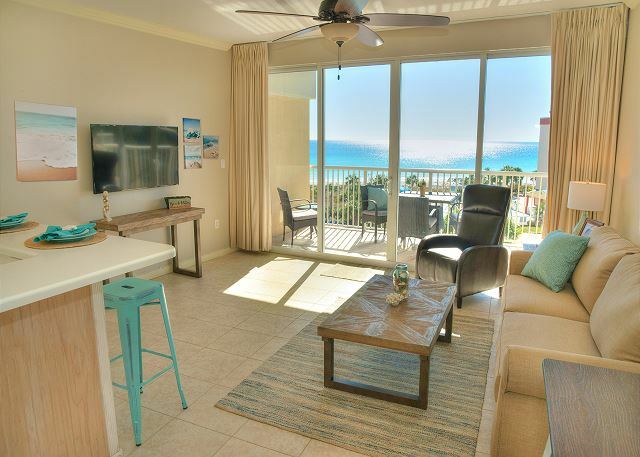 602 is a 6th floor unit that has everything you could possibly need to have a wonderful vacation here at Destin West. Book now! Pelican L03 is a 2 Bedroom plus bunk room lanai level condo. New everything...new furniture, new floors and new paint. Be the first to enjoy this newly decorated condo. 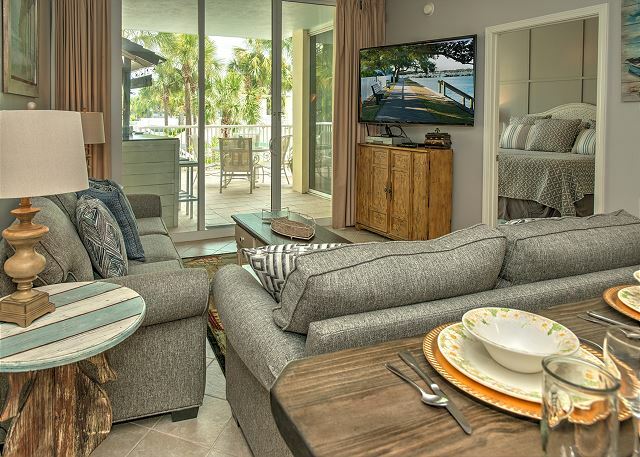 Pelican L07- Not only are you steps away from our Lazy river and the bridge that takes you to the best beach on the coast, you also have a wonderful Lanai condo with a spacious balcony and your own private grill. Book your next vacation today! SLEEPS 10!! Gulf 416-Great 2 Bedroom Plus Bunk Room Gulf View Condo! The owner spared no expense to bring you the best of condos. The resort has everything you need to make a relaxing and memorable vacation. Come Enjoy Beach, Pool, and Lazy River ! Gulfside 514 FOR THOSE WHO DESIRE THE BEST AND WANT CONVENIENCE AND EASE OF ENJOYMENT! THIS HOME AWAY FROM HOME IS MEANT FOR YOU! Heron 605--Great Views-Expertly Decorated! Waiting for You!! Heron 305 is ready and waiting for you and your family to enjoy! Everything in this condo is geared toward you and your family having a wonderful vacation. Large Balcony with Great View. Heron 309 offers great views of the lush lazy river area and the bayside amenities. It is conveniently located close to the bridge that leads to the beach and is just steps away from the bay. It's never too Early To Book Your Dream Vacation. Sit, Soak and Relax in Paradise at DestinWest! Free Boatslip with Week Rental! Heron 609 is located in the upscale Heron building in DestinWest Beach and Bay Resort. We are happy to share our second home with you and your family! 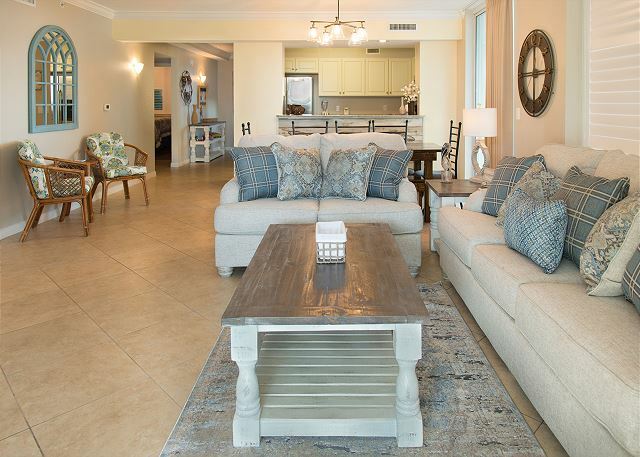 Osprey 406 is centrally located and is being re-furnished for your enjoyment. it has a front, wraparound and back balcony. Added to all that is our large lazy river, marina, and beach. With free use of a marina slip! Who could ask for anything more! Heron 307 Book Your Getaway Today! Convenient location and expertly decorated this condo will provide everything needed for a great vacation. 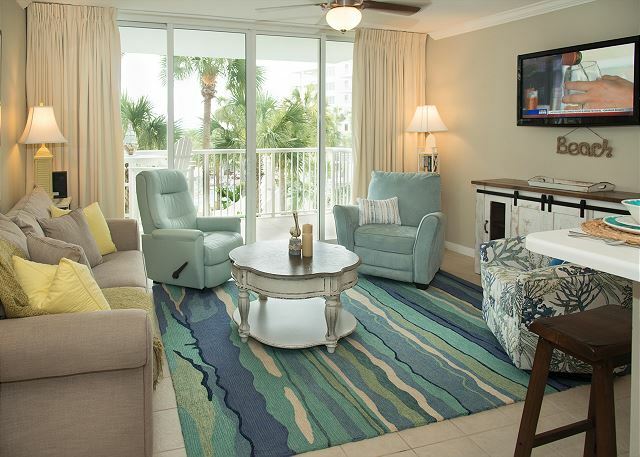 Heron 304 has everything that you will need for a great and stress free vacation. Everything is decorated to perfection. You ask for it and this condo has it! Owner spared no expense in decorating and furnishing this fantastic condo! Heron PH08- Top of the world meets Style, decor and fun. This unique condo is furnished with the best of everything, has fantastic views and yet is still convenient to all amenities. 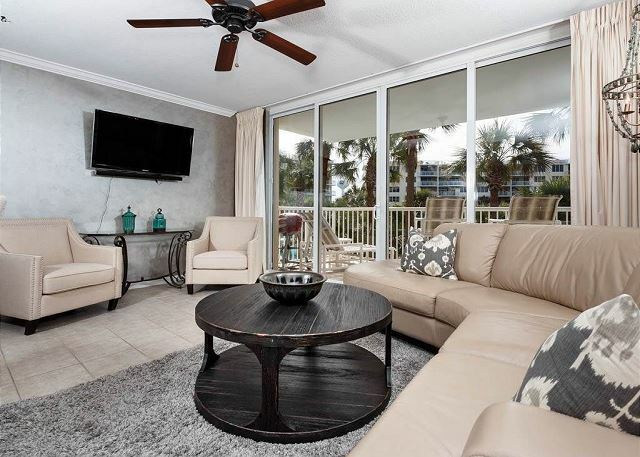 Heron L05--Beautifully Decorated 3 Bedroom 2 Bath Lanai with Hot Tub Great condo conveniently located, being steps away from the Lazy River and the Private pool of Heron. Osprey L05-- Lanai condos at DestinWest cannot be beat. In the Osprey building they offer you a four person hot tub and your own private grill. Not to mention steps that lead you right to the amenities of DestinWest. Heron L-09 --Lazy Lagoon--Doesn't Get Much Better Than This!!! Be the envy of those floating by on the Lazy River. Don't miss out or it could be you floating by saying "I wish I would have rented that condo". Steps to the pool with space for everyone! Heron L07--Put a smile on your face with our Cheery Decor! If you want a great vacation, book this condo now! It has everything and is so convenient to all amenities at DestinWest. Heron L08--Sit in the Hot Tub & Enjoy The Day! Book Now to enjoy one of the best condos at DestinWest. Location, decor and amenities make this the must have condo at DestinWest. Heron 401--Whether you are sitting on the balcony watching the dolphins and the boats on the bay or enjoying the large accommodations inside the condo you will find this condo to be well maintained with everything needed for your vacation. New to the rental market, this beautiful 3 bedroom/3 bath condo with so much space for the entire family AND friends. The views of the bay and the lazy river from this balcony are unmatched. 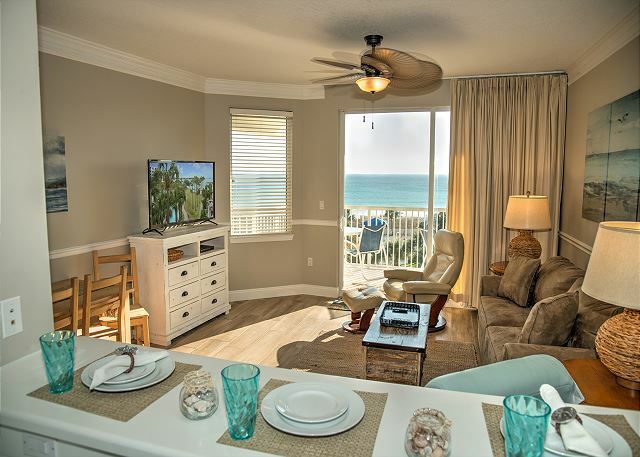 Sandpiper 307- Conveniently located, fully furnished, and breathtaking views. This condo has everything needed for your next dream getaway. Book today! This 1 bedroom plus bunk room condo has been newly updated and ready for you to enjoy. Pelican 408- The views of the lazy river and the bay from this unit are spectacular! Pelican 408 is fully furnished and waiting for your next vacation. Call to book today! Sandpiper 408- Book now to stay in a completely remodeled one bedroom condo with fresh new colors and decor. You will love the views from this condo and all of the natural light that comes through the living area. 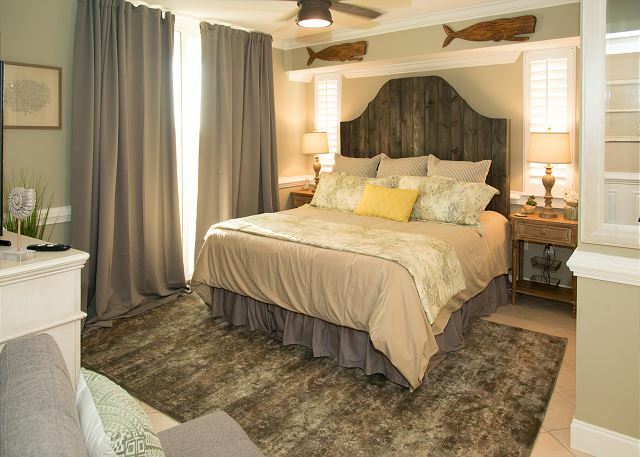 Pelican 606--Gorgeous Views at Destin West Bay Side fully furnished with top of the line furnishings and conveniently located. Call Now to Book!! Gulf 109-1st Floor Convenience!! 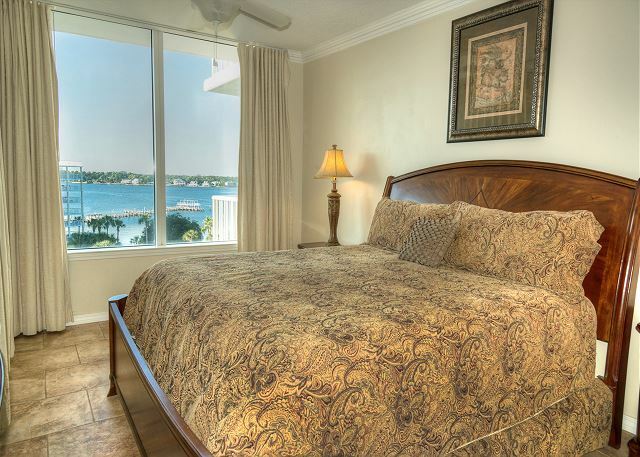 This condo makes enjoying the amenities of Destin West Gulfside much easier. Just walk out of your front door and enjoy the Beach a short distance away. An easy walk to the Lazy River on Bayside and the marina. If you're looking for convenience, this is the condo! Closest 1 Bedroom + Bunk Ground floor condo to the the beach walkway. Steps from the pool. Steps from the gym. Steps from the picnic/grilling area. This condo can't be beat in convenience and style. This gorgeous 1 bedroom plus bunk room/2 bath condo has style for days. Stay in this newly renovated, top of the line everything, condo. Condo remodel completed Jan 2018. Great location and great decor!! Great condo with a super beachy feel. Ready and waiting for your family to come enjoy! FREE BEACH SERVICE PROVIDED!!! Pelican 301-Beautifully decorated and conveniently located for your vacation. It is custom all through out with wainscoting in the hallway, custom kitchen, etc. This condo proves that sometimes the best can come in a small package. 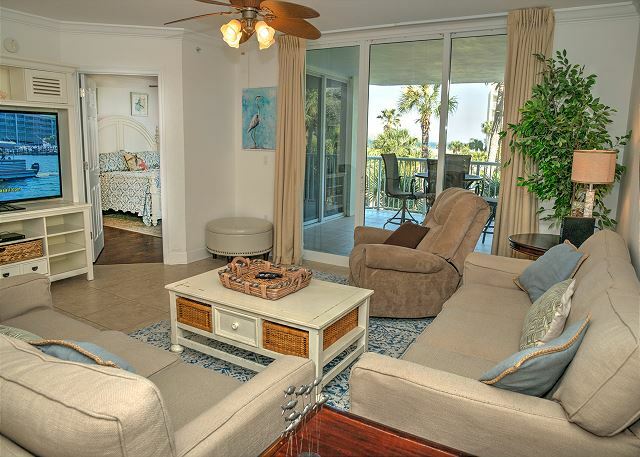 Sandpiper L01- Fabulous 2 bedroom Lanai Level Condo in Sandpiper building. Completely remodeled recently with updated decor, furnishings and paint. Just steps away from the pool and lazy river area. So convenient! !